If you’re an avid reader of cardriven.ca you may remember that I reviewed the Yukon Denali a few years ago. 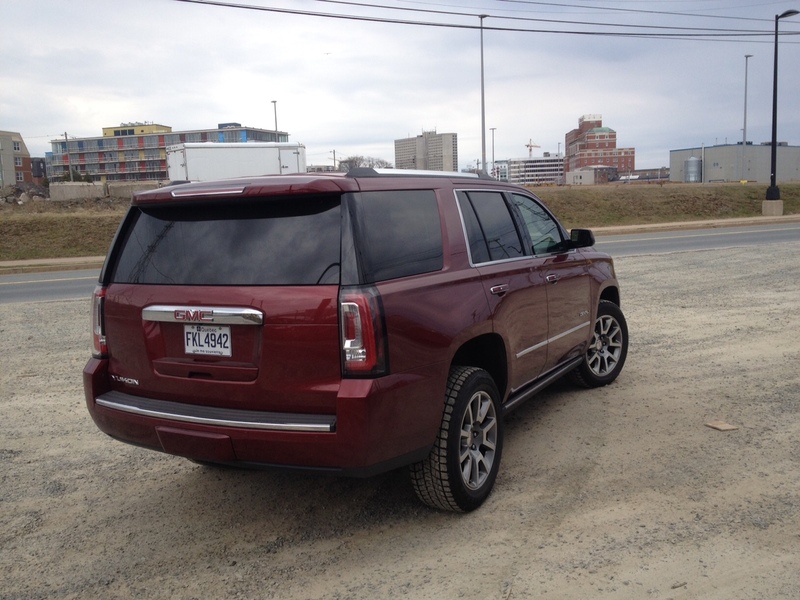 I called it my personal favourite of the three full-sized SUV’s that GM currently offers. I’ve since driven the Escalade, but I have yet to have a Chevy Tahoe as a press car, though I have driven the latest version before. So why review the Yukon again? Well there are a few key changes that, in my opinion, completely change the way it drives. As such, I spent the weekend with the 2016 version to see if these minor changes are really worth it. 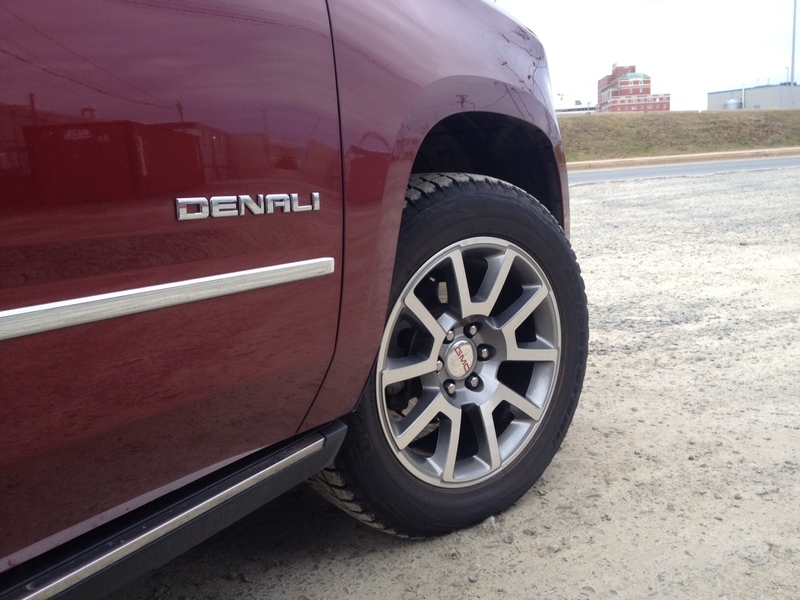 One of those those changes come in the form of the 20-inch wheels that are standard on the Denali trim. Believe it or not, you can opt for bigger wheels; 22 inches to be exact and that’s what my tester was equipped with when I drove the 2015 version. I’ll get to why that’s important in a moment, but in terms of exterior style, the Denali trim brings a unique grille to match those wheels along with chrome trim and, of course, Denali badging. I used to think the Yukon Denali was the best looking of GM’s full-sized SUV trio but after having seen the new Escalade in person, it’s definitely the looker of the three. 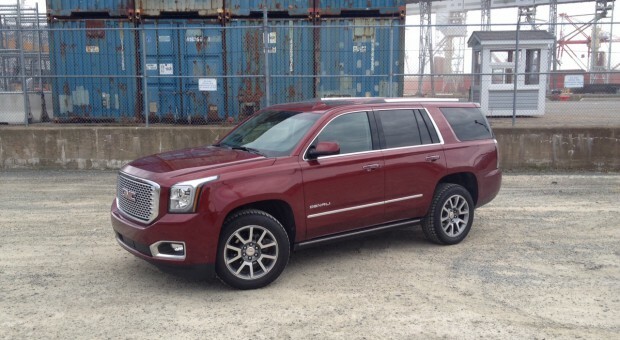 That could also be because the Denali version that sits on 20 inch wheels tends to fly under the radar a bit. Not that the wheels are homely or boring, but when you compare them to the 22’s, it tends to seem like a regular Yukon. 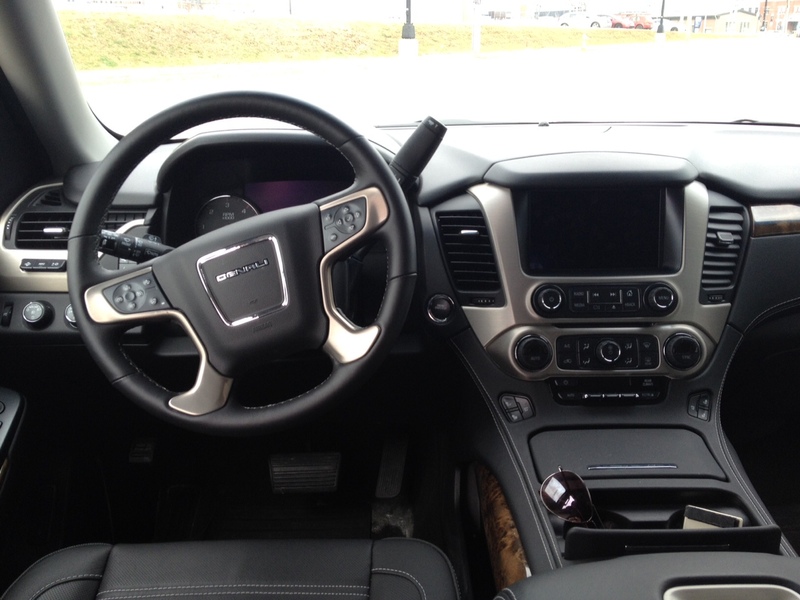 Inside, you’ll find a typical GM interior that is enhanced by luxury all around. Being a full-sized SIV’s most people won’t be wanting for more space, but if for some reason excess is your thing, the Yukon does come in XL form for added space. In regular spa though, the down side is those third row seats. Not only are they uncomfortable and offer little to no leg room, but when folded they still take up a fair among of space due to the elevated load floor. It was embarrassing not being able to fit a normal sized freezer in the back of the 2015 version because of the raised load floor. I didn’t dare to attempt to haul any sort of large items with the 2016 version. The Denali trim nets you a monstrous 6.2 litre naturally aspirated V8 and boy does it ever growl when pushed. One of the big changes from the 2015 version is that it is now mated to an 8-speed automatic as opposed to the ’15’s 6-speed auto. The end result is smoother engagement of the gears along with a bit more added efficiency. As such, I did much better in the 2016 version with my fuel consumption landing at 14.0 L/100 kms in mixed driving. 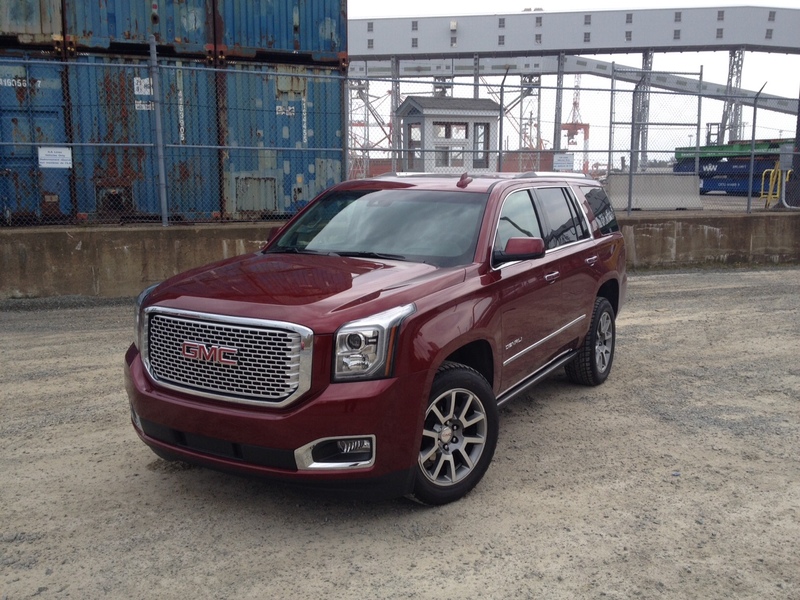 Officially, the 2016 Yukon is rated at 15.9 L/100 kms city and 11.1 L/100 kms highway. There’s no doubt that the Yukon is a supremely comfortable highway cruiser and those extra gears definitely enhance the highway driving experience. The plush seating along with simplistic controls and a host of driving aids really does help the Yukon feel as if you’re driving you’re living room down the highway. Of course, around town, it is much more cumbersome and a bit clumsy purely due to its size. It will sometimes take two tries to get it into a normal sized parking lot, but the automatic running boards which pop out in a jiffy will help ensure a more dignified exit to make up for the awkwardness of having to park this beast. But getting back to those 20-inch wheels, they are definitely the way to go, even though they help to tone down the looks in general. On the optional 22’s the ride was much harsher. The 20’s soak up imperfections in the road quite nicely – as a big luxury cruiser should do – and they tend to offer up less road noise as well. 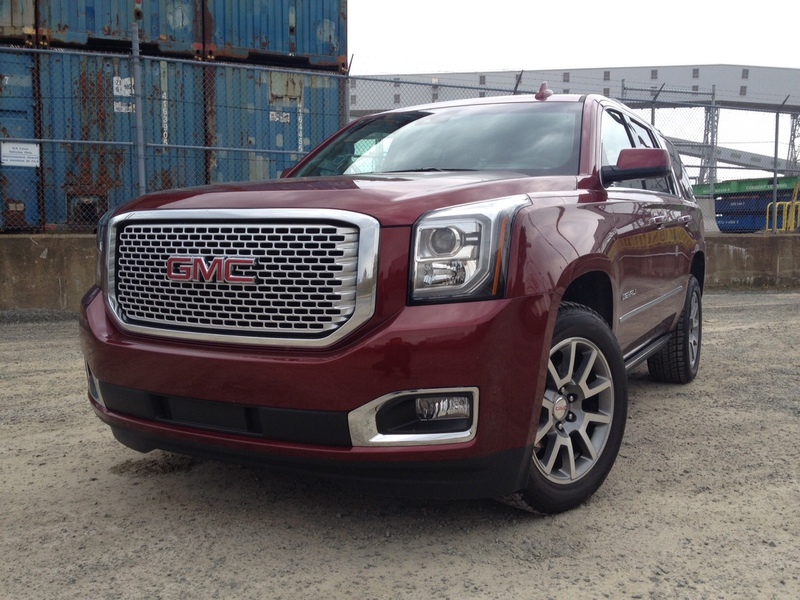 If you’re set on getting a full-sized SUV and have decided that the Yukon blends the best of the less showy Tahoe and very luxurious Escalade, then do yourself a favour and get the 2016 version without the optional 22-inch wheels. Because when spec’d out this way, the Yukon really does deliver the best of both worlds. You get a bit more added efficiency thanks to those extra gears and your spine will be very appreciative that you decided to put ride comfort ahead of style with the regular 20’s.